About 60% of India's population is employed in the agricultural and allied sector, which contributes 18% of the country's GDP. Official figures show 11,772 farmers committed suicide in 2013 across India. That is 44 deaths every day. An Indian farmer commits suicide every 30 minutes. About 200,000 Indian farmers have killed themselves over the last decade, according to media reports quoting India Rural Development Report 2012-13 released in September this year. The report, prepared by a government-funded Infrastructure Development Finance Company, was released by India's rural development minister Jairam Ramesh. It says 65% of India’s poor live in Uttar Pradesh, Bihar, Assam, Jharkhand, Odisha, Chhattisgarh and Madhya Pradesh in 2011-12, a significant increase from 50% in 1993-94. More recent news indicates that the crisis is continuing unabated. About two-thirds of the farmer suicides are being reported from 5 states: Maharashtra, Andhra Pradesh, Karnataka, Madhya Pradesh and Chhattisgarh. Other states are not immune. Indian Punjab has seen nearly 7000 farmers kill themselves in the last decade. Gujarat, the home of BJP's Prime Ministerial candidate Narendra Modi, reported 60 farmer suicides in 2012-13. A report by Center for Human Rights and Global Justice blames failures of biotech crops, particularly Bt cotton, for the tragedy. The report also says inadequate policy responses are contributing to the crisis. Others believe it is caused by poor irrigation. They say that cotton requires a lot more water relative to other crops. It takes 25,000 liters of water to produce one kilo of cotton, about 50 times more than to grow a kilo of potatoes, according to a report in Forbes magazine. The problem of suicides appears to be at least in part due to the fact that India's value added agriculture continues be among the lowest in the world. Unlike India, Pakistan managed to significantly raise agriculture productivity and rural incomes in 1980s through a livestock revolution. Economic activity in dairy, meat and poultry sectors now accounts for just over 50% of the nation's total agricultural output. The result is that per capita value added to agriculture in Pakistan is almost twice as much as that in Bangladesh and India. "Many raw commodities have intrinsic value in their original state. For example, field corn grown, harvested and stored on a farm and then fed to livestock on that farm has value. In fact, value usually is added by feeding it to an animal, which transforms the corn into animal protein or meat. The value of a changed product is added value, such as processing wheat into flour. It is important to identify the value-added activities that will support the necessary investment in research, processing and marketing. The application of biotechnology, the engineering of food from raw products to the consumers and the restructuring of the distribution system to and from the producer all provide opportunities for adding value." Although Pakistan's value added to agriculture is high for its region, it has been essentially flat since mid-1990s. It also lags significantly behind developing countries in other parts of the world. For example, per capita worker productivity in North Africa and the Middle East is more than twice that of Pakistan while in Latin America it is more than three times higher. There are lots of opportunities for Pakistan to reach the levels of value addition already achieved in Middle East, North Africa and Latin America.These range from building infrastructure to reduce losses to fuller utilization of animals and crops for producing valuable products. Value addition through infrastructure development includes storage and transportation facilities for crops, dairy and meat to cut spoilage. Other opportunities to add value include better processing of sugarcane waste, rice bran, animal hides and bones, hot treatment, grading and packaging of fruits, vegetables and fish, etc. Pakistan's growing middle class has increased demand for dairy, meat and various branded and processed food products. Engro, Nestle, Unilever and other food giants are working with family farms and supermarket chains like Makro, Hyperstar and Metro Cash and Carry to respond to it by setting up modern supply chains. Growth of value added agriculture in Pakistan has helped the nation's rural economy. It has raised incomes and reduced rural poverty by creating more higher wage jobs. It has had a salutary effect on the lives of the rural poor in terms of their ability to afford better healthcare, nutrition and education. Doing more to promote value added agriculture can accelerate such improvements for the majority of Indians and Pakistanis who engage in agriculture and textiles and still live in rural areas. The picture you are posting is way way old. And lastly, we have too many people in India. Few die it does not matter. China has killed a much bigger number of people during Mao's time and Long March. Not only that, their "police" makes much larger number of people "disappear". On Thursday, a day after a farmer died apparently by hanging himself from a tree at a protest rally in New Delhi, Indian Prime Minister Narendra Modi told lawmakers that his government would seek solutions to the “widespread” problem of farmer suicide. “Nothing is more important than a farmer’s life,” Mr. Modi said in the lower house of Parliament. Rajnath Singh, India’s home minister, described the death of Gajendra Singh Rajput at a protest ground in the capital as “tragic” and promised that police would conduct a “thorough probe” into the incident. Mr. Rajput, a farmer from Dausa village in the western state of Rajasthan had traveled to attend a political rally in the national capital to oppose the government’s new land-acquisition policy, according to Mr. Singh. At the protest rally organized by Delhi’s ruling Aam Aadmi Party in support of farmers, Mr. Rajput climbed a tree with a broom and a cloth in his hand, Mr. Singh said, according to information provided to him by the Delhi Police. Police officers present at the rally tried to help the farmer and immediately arranged for a ladder and also summoned the fire brigade to the spot. “They appealed to the people not to clap, cheer and shout. No one listened,” Mr. Singh said. The farmer fell from the tree, was immediately rushed to the hospital, where he was declared dead, he added. “Opposition and the government should get together and think of ways to get farmers out of crisis,” he said. The protests come as heavy, unseasonal rains have damaged crops in large parts of the country, causing difficult conditions for farmers who make up a large proportion of India’s workforce. “For many years, farmers’ suicide has been a cause of concern for the nation and governments,” Mr. Modi said in Parliament. The man was Gajendra Singh of Nangal Jhamalwaran village in Dausa district of Rajasthan. The 43-year-old father of three was known to be politically ambitious and had made a mark for himself as an expert in tying turbans. Contrary to earlier assumption that he was a poor farmer who was forced to take the drastic step, those who knew him, including members of his extended family, have asserted that he was not distressed and came from a well-to-do family. In fact, now questions are being asked on his portrayal as a farmer. His family has claimed that he was not a full-time farmer though he had ancestral land. The standing crop in his farm was also damaged in the unseasonal rains but the damage was to the tune of just 20-25%, people in his village claimed. Gajendra was politically ambitious and had even contested the assembly elections on a Samajwadi Party ticket after first starting out with the BJP. He later got involved with the Aam Aadmi Party, reports said. His family members claimed that he had left for Delhi 3-4 days ago. While leaving he had told them that he will try to meet Arvind Kejriwal. After he committed 'suicide', one of his relatives claimed that Gajendra had met Deputy Chief Minister Manish Sisodia at his residence just hours before he hung himself from a tree at Jantar Mantar. The other highlight of his personality was his turban-making skills. Gajendra could tie a turban in less than a minute and was most sought after during weddings and political rallies in Rajasthan. In 2010, Gajendra had won the Mr Desert title, a Rajasthani cultural pageant. INDIA’S monsoon is one of the world’s most important weather events. About half of the country's population—that is, 600m people—depend directly on the rain it bears. The monsoon sweeps northward across the subcontinent, bringing moist air from the south and south-west Indian Ocean. As it hits the land, and especially as it rises towards the Himalayas, it dumps its cargo of water, producing about three quarters of India’s total rainfall between June and September. Two-thirds of Indian agriculture is still fed by this rain, rather than by irrigation, which means India’s harvest depends on it. When the monsoon fails, as it has done this year, millions suffer. Crops wilt or fail altogether, farm land dries up, reservoirs, already too-small, run low, and winter crops (which are mostly irrigated) are imperilled. In some places this year, a lack of rain has led to shortages of drinking water. Like all weather patterns, the monsoon is erratic. Four years in ten count as abnormal. But this year—in which total rainfall is 14% below the 50-year-average between June and September—is exceptional. Droughts of this sort happens about once every 18 years. There is also extreme variation within the variation. Some parts of the country, the western state of Gujarat for example, have seen higher-than-normal rainfall. Others, especially in the north and the eastern coast, have had precipitation that is 40% below average. Climate change seems to be making the variations more extreme. The Intergovernmental Panel on Climate Change, an international group of scientists who advise governments on global warming, has warned that because of climate change monsoon rainfall extremes are likely to increase. But exactly why this should so be is up for debate. No one yet fully understands the link between the monsoon and El Niño, a warming of the waters in the central and eastern Pacific Ocean. Over the past century, most climate scientists have argued that a strong El Niño is associated with a weak monsoon because, as the Pacific warms, the air rises and comes down again over the subcontinent, driven by prevailing wind patterns. This descending warmer air is associated with higher pressure, less moisture and a weaker monsoon. The current El Niño is the strongest since 1997 and 1998, according to Australia’s Bureau of Meteorology, and will be at its most powerful at the end of the year. During the 1980s and 1990s, however, this link seemed to be broken. The year 1997 saw one of the strongest El Niños on record, but a normal monsoon. Balaji Rajagopalan of the University of Colorado, Boulder, argues that the puzzle can be explained by looking at which part of the Pacific warms up during an El Niño. If the eastern waters warm, the air comes down again over Indonesia and South East Asia, which tend to be drier than normal. But this may not affect India. If the central Pacific warms, the high pressure tends to form over India and the monsoon fails. If Professor Rajagopalan is right, this year’s El Niño is getting stronger in the central Pacific than in the east. The Indian Meteorological Department is hoping to incorporate this information into its monsoon forecasting system. It would also give rival producers such as Pakistan, Thailand and Brazil the chance to boost shipments from their ports. "India will need to import next year due to a production shortfall," Ashok Jain, president of the Bombay Sugar Merchants Association (BSMA), told Reuters. "Drought has severely affected cane plantations in Maharashtra. The government should stop exports now to reduce import requirements in the next season." The El Nino weather phenomenon, which brings dry conditions to many regions, has stoked the worst drought in decades in some parts of India, with thousands of small-scale sugar cane growers in Maharashtra state failing to cultivate crops for the next marketing year, starting October. "Even for drinking water we are relying on water tankers. It wasn't possible for anyone from our village to cultivate cane," said Baban Swami, a farmer standing in a parched field in the Latur district of Maharashtra, around 500 km southeast of Mumbai. TIKAMGARH DISTRICT, India — For years, Lakshman Pal, 28, planted wheat and tended to his small field here. Each season, he hoped for rain. He looked up at the sky and waited for the showers that normally came. But for the past two years, they’ve hardly come at all. His crops eventually withered and died, crumbling to dust. In early May, Pal returned from a spell of work in the distant state of Haryana, where he earned 250 rupees, or about $3.70, a day toiling long hours as a laborer. Fifteen other members of his family also migrated to various cities, searching for work and leaving behind women, children, the elderly and a handful of younger men to tend to the land. Pal borrowed money from the bank and a local moneylender to pay for medical treatment for his mother, who has cancer, and he was now deep in debt. Back in Khakron, his village, Pal found himself not only in debt, but also with no water for his fields, no crops to harvest, no food for his family, no money for his mother’s treatment. He awoke one morning in mid-May, before dawn, and killed himself in his field. Life is precarious in Bundelkhand, a vast rural landscape in north-central India that I drove through on a weeklong trip for The WorldPost in late May. The region, which consists of over 27,000 square miles across the states Uttar Pradesh and Madhya Pradesh, is one of India’s poorest areas, populated mostly by poverty-stricken farmers living in rudimentary villages. And now, it’s suffocating under an intense drought that’s affected a staggering 330 million people nationwide. As the crisis deepens, the country that celebrated the 1960s agricultural revolution and a resulting boom in production of food grains is now seeing its farmers dying in debt and despair. In many cases, farmers accrue debt from loans for seeds, fertilizers and equipment. And the debt can carry down to their children and grandchildren. Stories like Pal’s are repeated with frightening regularity all over the country. More than 2,200 farmers reportedly died by suicide in just one state — Madhya Pradesh — between April and October of last year, and more than 12,000 reportedly killed themselves across the country in 2014. Severe dry spells have become much more common in Bundelkhand in recent years, a consequence of both climate change and the lack of a robust irrigation system, turning this historically dry area into a parched and barren land. Groundwater reservoirs have been dangerously depleted, and agriculture has stagnated. Temperatures are consistently over 100 degrees Fahrenheit and sometimes top 115. Since the early 2000s, droughts have become worse and the annual monsoon, which is critical for agriculture, has become erratic. The drought was especially bad from 2003 to 2010. In 2011, the region experienced much higher rainfall — in some districts, more than 500 percent above normal — and flooding was widespread. Disappointing monsoons in 2012 and 2013 gave way to drought again in 2014. It hasn’t abated, and the network of lakes, rivers and wells, which had always supported the people, have gone almost completely dry. The livestock sector contributed more to GDP value addition in FY16 than large-scale manufacturing, according to the State Bank of Pakistan’s annual State of the Economy report. The contribution of livestock was 11.6pc against 10.9pc of large-scale manufacturing (LSM), the report reveals; but the sector itself grew only 3.6pc, below the 4pc level growth it had recorded in FY15. Since the beginning of this century, the livestock sector has been growing steadily however more growth in the sector has come through value-addition in meat and milk processing and less through increase in animal headcount. “Between FY01-10 we saw a growth (in the livestock sector) supported largely by milk processing; from then on both milk and meat processing have been fuelling growth,” says a senior official of the Ministry of National Food Security and Research. Milk and meat production, processing and value-addition have achieved several development milestones over the years. The dairy manufacturing industry, which took root though packaged milk still accounts for 5pc of our total milk production. The establishment of the Pakistan Halal Authority and a set of incentives including tax exemptions and the reduction in customs duty on the import of machinery for meat processing for setting up fresh abattoirs are expected to further boost livestock growth. Immediately after the authority started issuing Halal certificates, four meat exporting companies got supply order conformations from Malaysia, a hitherto unexplored meat export market, industry sources say. While milk and dairy product companies continue to thrive, mainly on local demand, meat processing firms are more dependent on exports. They are now able to explore new markets after having access to Halal certification facility at home. Previously, they had to get their export consignments certified as Halal from foreign sources. Fauji Meat a subsidiary of Fauji Fertiliser that commenced operations this April — has come in as a big morale booster. With a daily production capacity of 100 tonnes of meat (85 tonnes beef and 15 tonnes mutton), the company has started exporting both frozen and chilled meat products primarily to Kuwait and a few other countries, officials say. Al-Shaheer Corporation, an old meat exporting company, has not only maintained its market share in Bahrain, Kuwait, Oman, Qatar, Saudi Arabia and the UAE but its Meat One and Khaas Meat are doing a roaring business in local markets as well. In addition to selling its meat products through upscale superstores and its own outlets, the company also makes bulk sales to local institutions, including top hotels and restaurants. Both Fauji Meat and Al-Shaheer Corporation have their own large animal breeding farms to ensure uninterrupted supply of healthy animals for regular slaughtering. The fact that after 2010, meat processing and exports have made real big progress is evident in several developments. First, it was towards the end of 2010 that the All Pakistan Meat Exporters and Processors regrouped as a formal trade association and now boasts 33 registered members engaged in meat exports to GCC nations, Afghanistan and some North African countries. Second, meat exports have grown rapidly—from 72$m in FY09 to $269m in FY16. Besides, during the current decade local sales of processed meat have taken a quantum leap so that one can find neatly-arranged frozen and chilled primal cuts of red meat in most sizeable superstores in the big cities. Despite big strides in industry and services, two-thirds of Indians depend on farm-based income. Nearly 60 percent of the country’s farms lack irrigation facilities, leaving millions of farmers dependent on the rains. The monsoon is critical to replenish 81 reservoirs necessary for power generation, irrigation and drinking. About half of India's farm output comes from summer sown kharif crops such as rice, sugar, cotton, coarse cereals. The monsoon also refills 81 nationally monitored water reservoirs crucial for supply of drinking, power and irrigation water supply. The June-September monsoon is likely to be 96 percent of the long-period average, the Met department said on Tuesday, a forecast that will be cheered by millions of farmers and the government alike. It is essentially a shift in the prevailing wind patterns. Drafts of breeze from the south Pacific travel northwards, carrying moisture along the way. It traverses nearly 8,000 km before reaching the Asian land mass, resulting in rainfall and offering respite from a sweltering summer. How is it distributed across India? Kerala is the south-west monsoon’s first port of landfall in mainland India. It arrives in Kerala in the first of week of June, having covered Andaman and Nicobar islands a week before. After hitting Kerala, it breaks out into two branches: one over the Bay of Bengal and the other over the Arabian sea. In a normal year, it covers the entire country in a month. It hits Maharashtra around June 15 and Delhi around June 29 before travelling further north-west. Is monsoon essentially an Asian phenomenon? No. Monsoons happen in the world’s other regions too such as Europe, Chile, Africa and North America. How is the monsoon’s progress recorded? Satellite images now allow weather scientists to fairly monitor monsoon’s course and quantum. According to the Met’s classification, the monsoon is considered normal if rains are between 96-104 percent of the 50-year average rainfall of 89 cms. The monsoon is taken to be below normal if rains are between 90–96 percent. If less than 90, it is considered deficient. Why is the monsoon so important for India? A curfew has been imposed in a district of the central Indian state of Madhya Pradesh following a day of violence in which five farmers died. The farmers died in Mandsaur after shots were fired during their protest to demand loan waivers and better prices for their produce. Protesters accused the police of opening fire, but officials blamed some "anti-social elements" for the deaths. State Home Minister Bhupendra Singh said an inquiry had been ordered. Farmers have been protesting for days to put pressure on the government and other parts of the state have also witnessed similar rallies. Experts say traders are not offering good prices to farmers because of oversupply caused by a bumper harvest. Madhya Pradesh Chief Minister Shivraj Singh Chouhan said he was "deeply pained by the turn of events". "I have already accepted all fair demands of the farmers," he said. Mr Chouhan also announced that the state government would give compensation to the families of the victims, and pay medical expenses for the injured. Rahul Gandhi, vice-president of the main opposition Congress party, said Mr Chouhan's government "was at war with farmers". Mr Chouhan rejected the allegation and accused the Congress party of inciting farmers. There are protests, and calls for political action, over the plight of India's farmers at present--and the one important point we've got to get across to people is that India's farmers should be going bust because that's how economic development actually happens. People stop doing low productivity things like rain fed labour intensive agriculture and go off and do more productive things like working in factories or producing services. It's entirely true that we should make the transition as painless as possible, no doubt about that, but we do not want to be preventing the change from happening because that just keeps everyone poorer than they need to be. The harsh truth is that not being able to make a living doing something is the universe's method of telling you you should be doing something else. This is as true of farming as it is of buggy whip manufacture. We are all, the people doing the labour most of all, made richer by people moving from low productivity activities to higher. The political reaction to this we understand, of course we do. Some 50% or so of Indians are involved in this low productivity agriculture and they've all got the vote. But that doesn't change the economics here, which is that we'd really very much like people to stop being farmers and go and do something else more productive. India has some 50% or so of the population in that agriculture and the output has a value of some 15% or so (rough numbers) of GDP. Both what will mark out India as a rich country, and what will make it one, is when the labour and output profiles of agriculture are similar to those other rich countries. Because that's just what getting richer as a whole means. That the vast majority of the population stops standing around in muddy fields and goes off to do something more productive instead. It's not just that this is what has happened everywhere that has got rich it's that this is the very definition of a place and population getting rich. Not being able to make a living farming is the universe's way of telling you to do something other than farming. India should smooth the transition, certainly, but not subsidise people to remain farmers. TSR Subramanian said he launched GM cotton in 1990s and the decision was responsible for suicide of thousands of cotton farmers. Former Cabinet secretary TSR Subramanian on Friday said that he regrets having allowed Genetically Modified (GM) cotton in the country over two decades ago. "In 1990s, I introduced GM cotton in India. 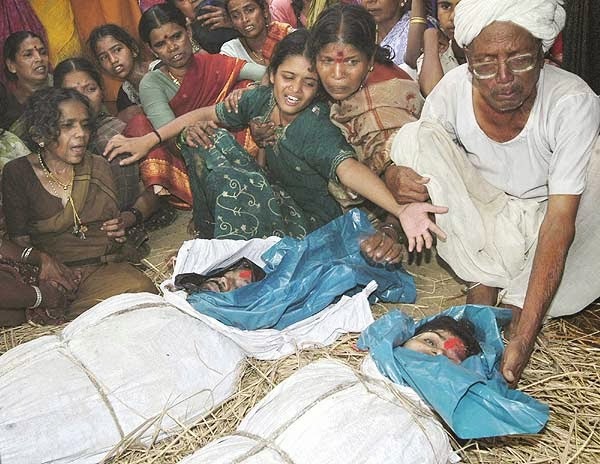 Twenty years later, I regret...I am responsible for suicide of thousands of cotton farmers," Subramanian said at a panel discussion at a book launch function. Subramanian, a 1961 batch IAS officer, further said that most European countries and Japan don't allow GM crops. Talking about the performance of the Narendra Modi government, Subramanian said, "This government has done wonderful work in three years. I believe that the present dispensation should get 10 years." "Failures of India can largely attributed to IAS class...Blame also should go to economists of India who studied in Harvard, Oxford University and now working for the Government of India but don't know anything about India," he said. The China-Pakistan Economic Corridor (CPEC) is a golden opportunity for overall development of this region and Pakistan should reorganise its agriculture sector to get a major slice of the $100 billion worth of agriculture produce imports by China, suggested Muhammad Mehmood, Punjab Agriculture Secretary. Speaking at the launch of a study on “CPEC – Prospects & Challenges for Agriculture”, Mehmood pointed out that nearly one-fourth of the world’s population was living in China and most of its exports would be routed through Pakistan after the completion of CPEC. “Containers full of exportable surplus will be sent to various international markets, but on their return, these containers will be empty and we must capitalise on the opportunity to export our surplus agriculture produce to China,” he said. Mehmood revealed that per capita income of China was increasing substantially, bringing a visible change in people’s lifestyle and food habits there. “Like other affluent societies, they also prefer rich and costly food and fruits,” he said, adding Pakistan could get maximum benefit of the emerging change. Major Chinese importers will also be invited to utilise this land for growing high-value fruits in addition to developing the agriculture processing industry on modern scientific lines. “Its trickle-down effect will provide an opportunity to our farmers to upgrade their technologies and develop agriculture as a profitable business by shunning centuries-old practices,” Mehmood said. He told the audience that foreign consultants had been engaged to analyse why Pakistan had not been able to get its due share in Chinese imports despite its friendly relations and close proximity. Responding to a question about a research project on the China-Pakistan agricultural technical cooperation, the agriculture secretary insisted that the Punjab Agriculture Research Board was extending liberal grants to the viable projects planned by the public and private sectors. “Initially, Rs259 million had been allocated for this purpose. The funding was immediately increased to Rs750 million and it would be further enhanced to Rs3 billion in the next three years,” he said. He asked the Faisalabad Chamber of Commerce and Industry president to send the project to the research board where a group of experts would review its viability and approve the requisite grant. You argue in your book that the Left in India approaches the issue from the same angle. They care largely about how people at the bottom are doing rather than inequality per se. This, I thought, was interesting. The totemic intellectual debate in India’s recent past has been between Jagdish Bhagwati and Amartya Sen. In a sense, neither of them places inequality front and centre. For Jagdish, it’s growth that matters, everything else can follow. For Amartya, what matters is the condition of the people at the bottom. Neither of them is really looking at the gap between the top and the bottom. That means you’re missing an important component of what makes a successful growth model. Inequality isn’t just about the billionaires, it’s about the fact that the top 10%, and particularly the top 1%, have done disproportionately well. The vast mass of everyone else, including those who you’d consider to be middle-class, although in absolute terms they’re doing much better, in relative terms they’re doing much worse. That’s not how you build a successful country. It’s pretty clear that very unequal countries find it much harder to modernise. Look at Latin America, that’s the classic middle income trap. Countries that have managed to break through to become rich countries either have fantastic natural resources—like the oil emirates, and they’re not the ones you want to follow—or they’ve managed to create a kind of social and economic model that takes everyone along with them. What happens if India continues on this path of the top pulling away from the rest? What does that mean for modernisation and reform? Reforms are complicated, they require winners and losers. You have to have a sense that the winners will look after the losers. Farmers, for instance. This is not a good time for them. A lot of them are going to have to work somewhere else because India desperately needs a much smaller and more efficient farm sector. But if the sense is that everyone’s in it for themselves, then that makes it much more difficult to create the coalitions that you need for such changes. On Oct. 02, more than 30,000 farmers came knocking at the doors of India’s capital city, New Delhi. Most of them were from Uttar Pradesh, the politically crucial northern state in India’s Hindi heartland, which hosts the highest number of seats for the national elections next year. The non-violent rally, called by the Bharatiya Kisan Union, began on Sept. 25 from Haridwar, some 200 kilometers north of Delhi and was to end in the national capital on Oct. 02. But the crowds were met with water cannons and tear gas shells, and were beaten with lathis and batons at the borders of Delhi as the Narendra Modi government imposed a curfew to stop them from entering the city. However, when the rally refused to disperse, the government relented at midnight and let them in. The farmers have called off the protest, despite the government not heeding their two main demands—an unconditional loan waiver and the Swaminathan committe-recommended minimum prices for crops. Quartz spoke with a few of the protesting farmers at Ghaziabad on the outskirts of Delhi, where they’re still camping, to understand what drove them to participate in the seven-day rally and even risk their lives. Most of them are sugarcane cultivators from Uttar Pradesh and belong to the upper-caste Hindu community, a demographic that is perceived as the heart of Narendra Modi’s support base. Last month, when Singh left his village to be part of the rally from Haridwar, rains were running havoc on his crops. He has little hope of a good yield this year. “All they have done is politics in the name of cow, cow dung, and caste,” says the farmer, who had also voted for Modi in 2014. Now, he is not sure which political party to support. He does not trust assurances the government made to the farmers and wants an unconditional loan waiver, as well as the implementation of minimum prices for food crops as per recommendations of the 2004-06 Swaminathan commission, a demand successive Indian governments have been rejecting. Diesel prices have risen by 26% in India this year, making it significantly more costly for the nation’s 263 million farmers to work fields and harvest and transport crops. Alongside rising petrol costs, prices of key fertilisers such as potash and phosphate have jumped nearly 15% and 17% respectively over the past year, “as companies pass on the rise in global prices and the impact of the weak rupee to farmers”, says Reuters. India is the world’s second-biggest producer of staples including rice and wheat, but “imports all its potash needs and relies on foreign supplies for nearly 90% of the phosphate it uses”, adds the news site. “It’s a double whammy for farmers, who have to bear the brunt of lower crop prices and higher input costs,” says Devinder Sharma, an independent food and trade policy analyst. Earlier this week, thousands of protesters under the banner of the Bhartiya Kisan Union (Indian Farmers’ Union) marched to the capital, New Delhi, from adjoining states. Union member Dharmendra Malik told Al Jazeera that police fired “tear gas and plastic bullets at unarmed farmers”, and turned water cannons on them, in order to prevent the demonstrators from entering the city. He said about 50 people had been injured, a claim that the police have denied. With elections due to be held in April or May next year, “unions representing farmers and other groups have staged protests in an effort to secure sweeteners in exchange for support at the ballot box”, the news site says. The majority of the demonstrators at Wednesday’s march were from Uttar Pradesh, which is India’s most populous state, with more than 200 million people, and the most important electorally. Farmer Abhimanyu Kohar condemned the police response to the protest, and said that agricultural workers will continue to demonstrate until their demands are met. “There should be dialogue within a democracy. But this government is in a denial mode, they are unwilling to accept that there is a farm crisis. They will pay heavily in the upcoming elections for what they have done today,” he told Al Jazeera. Official economic data supports the claims of widespread suffering among the sector’s workers. “Rural wage growth started decelerating sharply in the middle of last year, and latest data shows that they are yet to show a credible recovery,” says the Hindustan Times. “Agriculture alone can no longer sustain families dependent on farming in the villages of Uttar Pradesh,” opposition politician Yashpal Malik told New Delhi-based newspaper National Herald. Malik also claimed that Prime Minister Modi’s government “is forcing farmers to keep the prices low to run state subsidy schemes”. Modi and his right-wing Bharatiya Janata Party (BJP) “routed all opposition parties in Uttar Pradesh in the last elections”, says Al Jazeera. The PM remains personally popular, according to recent polls, “but after four years in power, support for his party has been eroded by voter concerns about jobs and the spike in fuel prices”, the site reports. Tens of thousands of Indian farmers have marched to the parliament in the capital, Delhi, to highlight the deepening agrarian crisis. They arrived on Thursday from across the country and held a rally demanding better crop prices, drought relief and loan waivers. Indian agriculture has been blighted by a depleting water table and declining productivity for decades. This is the fourth such farmers' protest in the past year. Farmers make up important voting bloc in the country and, analysts say, given the scale of the protests, their discontentment could hurt the ruling Bharatiya Janata Party (BJP) in next year's general election. "We voted for the BJP but anti-farmer policies of the government have hit us hard," Lakhan Pal Singh, one of the farmers participating in the march, told Reuters news agency. One of their chief demands is a special parliamentary session to discuss solutions to the agrarian crisis, including a full loan waiver and higher crop prices. Half of India's population works on farms, but farming contributes only 15% to the country's GDP. In most states, governments have been less than swift in paying the farmers more for their crops - the federal government sets the price for produce and procures crops from farmers to incentivise production and ensure income support. Indian farmers also struggle with debt owed to banks and money lenders. And crop failures trigger farm suicides with alarming frequency. At least 300,000 farmers have killed themselves since 1995. Daughters, wives and other family members of farmers who took their own lives over crop failure or mounting debt are also participating in the protest - with some of them carrying photographs of their loved ones. Riaz Haq commented on Riaz Haq's blog post Hindutva: Legacy of the British Raj?